Create a new table as users_information with below structure. insert some dumping data. This data will load bootstrap model. Load Bootstrap CDN file to your <HEAD> tag. ng- app - The ng-app directive tells AngularJS that this is the root element of the AngularJS application. Create a new index.html file load angular ajax call dynamic data responses. data-ng-init - execute the angular controller function on page load. Here I am using a usersInformation() function to get all user information server side response. ng-repeat - make a loop for JSON object data. ex : users_list scope value (user in user_list) user scope object value. 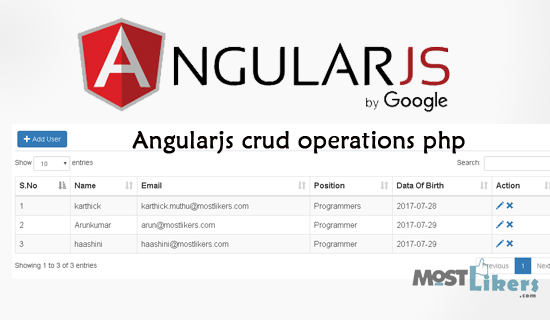 Create a new controller file user.angular.js load curd functions. First, create app module name (my_app) to the angular control. $scope.addModal - Load boostrap modal function. Here i am calling new usersInformation add boostrap modal. $scope.EditModal - Loading 1 row value to boostrap modal, angular.copy() - Copy the ng repeat row value. $scope.DeleteModal - Delete ng repeat object value by using this $scope.users_list.splice(index, 1); code. You can use any PHP framework,.Net framework, Webservices For Server side curd operation. Just give your response in JSON format the above angular script will work. I have some little bit knowledge in PHP Script. So I am using PHP Script for Add, edit, delete usersInformation. For a beginner, I would suggest PHP curd operation (PHP Curd operation with bootstrap modal) tutorial. Fetch all the rows in the users_information table. Convert PHP response has JSON parse. max="<?php echo date('Y-m-d'); ?>" ng-model="users_form.dob"
How much are you making monthly from this blog ?